Balmoral Bathers Pavilion is a restaurant for people that have eaten well in lots of places. This restaurant is near the cutting edge with interesting combinations in its dishes and daring ideas. Owned and operated by well-known chef Serge Dansereau, Balmoral Bather’s Pavilion offers creative food with a culinary precision not seen in many other Sydney restaurants. The restaurant sits in the prime position on the Esplanade at Balmoral Beach and as you walk in you can see right out to the ocean through Middle Head. This is a delightful position early in the evening, watching the yachts meandering their way back to The Spit. 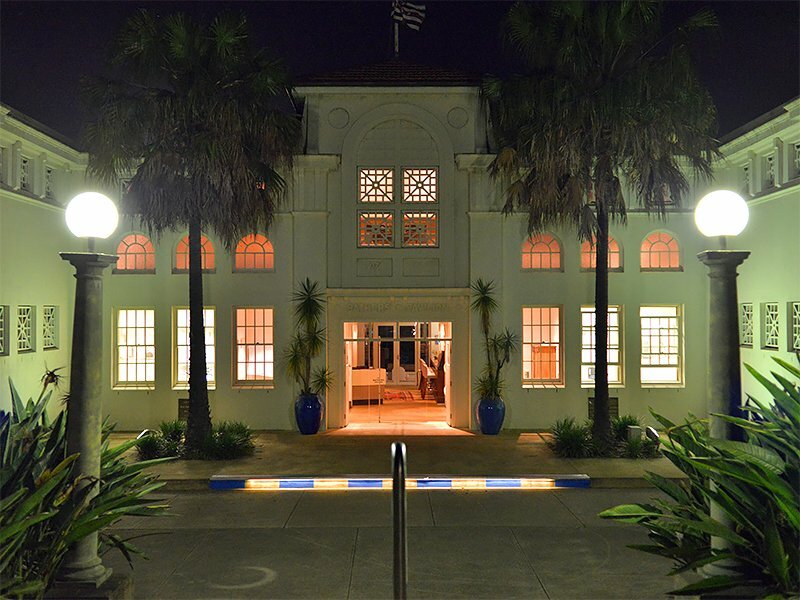 The magnificence of the Moorish inspired architecture of the Balmoral Bathers Pavilion. 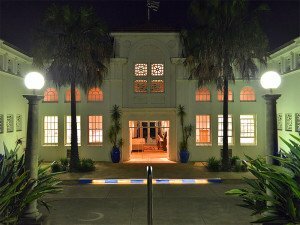 The building owes much of its heritage to the great depression. Until the 1920’s Balmoral had been an under-developed area of Sydney and decent transport links didn’t get to Balmoral until 1922. It was in 1924 that the waterfront was turned in to an esplanade using funds set aside to alleviate unemployment during the depression and from there The Bather’s Pavilion was commissioned and built by the end of the decade. Spin forward to the 90’s and the building was redeveloped under the guidance of Alex Popov as architect for new occupants Victoria Alexander and Serge Dansereau. 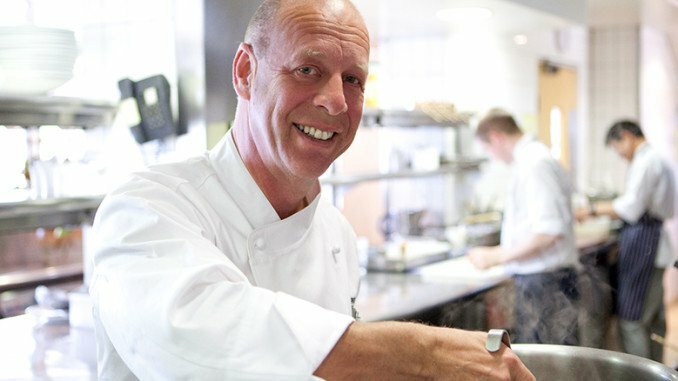 A French-Canadian by birth, Dansereau earned his culinary reputation at The Regent in Sydney catapulting it to stardom over his eighteen year tenure as head chef. Dansereau and Alexander’s vision created The Balmoral Bather’s Pavilion but sadly their business relationship did not last with Alexander departing their venture leaving Dansereau at the helm. As you walk up to the building you are greeted by its Moorish-inspired architecture and its size. This is a big building simply to act as some changing sheds for Balmoral Beach! These days, it makes an impressive restaurant and café. In any restaurant it is very difficult to sample everything that a menu has to offer, but this evening I did get to sample four entrees and three main courses. If you are after a great way to sample the fare, Balmoral Bather’s Pavilion offers a five course and even an eight course degustation menu which will introduce you to a wide range of their dishes. As a side note, they also have a complete vegetarian menu, not just a tokenistic dish tucked-away at the end of the menu, just after the list of steaks. Their vegetarian menu is impressive and clever. But for me, I went the whole meat, fish and everything in between. The wine list is daunting. It is as long as it is broad with selections from across the globe. Thankfully, they have a wide range of wines by the glass and a good sommelier who can suggest a decent glass for the appetisers and a suitable alternative for the main course. Marinated Kingfish with celery jelly and shaved fennel. Chicken liver parfait, with minted cauliflower was light and full of fresh flavours. The Chicken parfait was beautifully smooth and was served with Pink Lady apple granite and a champagne jelly. The jelly was lovely and a welcome surprise, setting off the bolder flavours of chicken. The marinated Kingfish, celery jelly and shaved fennel worked well together. The fish and mayonnaise were pleasing with sparks of spice from the addition of pink peppercorns. The roast celeriac with spanner crab looked fantastic, a real crowd pleaser. Celeriac and crab had a good, round full flavour. The dish came served with avruga caviar forbidden rice which was dark and an interesting textural contrast to the crab-meat. The caramelised purple carrot with black muscles was a little disappointing. Served with a mandarin sauce, I found the citrus flavours overpowered the subtle flavours of muscle and carrot and by contrast, was the weakest of the four appetisers sampled. Seared Albacore tuna with caramelised yoghurt and semi dried strawberries. 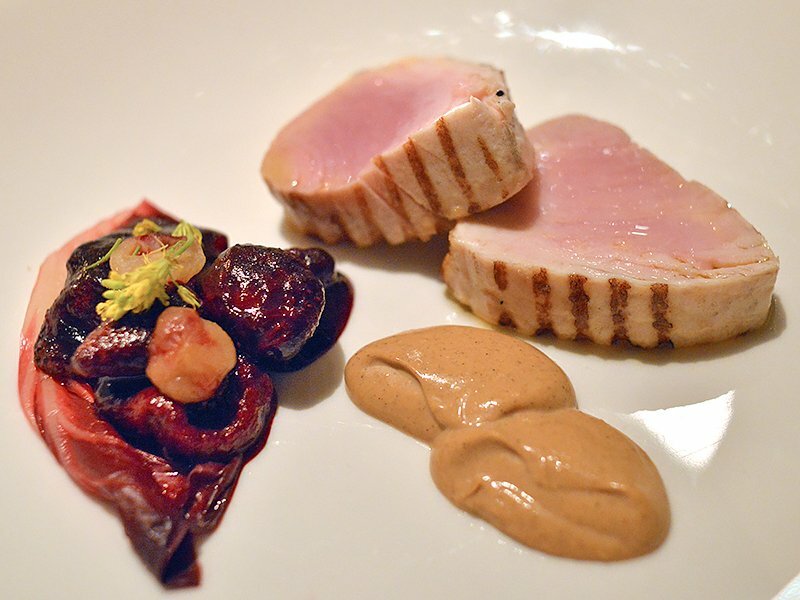 The seared Albacore tuna was beautiful with a subtle smoke flavour, perfectly cooked with a tinge of pink. Served with semi-dried strawberries and native lemon the elements worked well and the caramelised yoghurt was an interesting contrast. Duck breast with orange and miso sauce was the winner amongst the main course dishes sampled. Soft and succulent pieces of duck served with a good sauce and a slash of smoked nori flavour painted beside the portions the dish looked great and tasted better. The pan roasted Mulloway looked impressive with shaved courgette and plum wine foam. The simplicity of the fish with a few herbs was the star of the dish and the foam made it visually pleasing. It was superb. Desert? I didn’t get to desert as I had eaten well in the preceding two courses. But with coffee and freshly made petit-fours to round out the meal, the experience did not disappoint. The service was well paced, with a generous time to sit, take in the surroundings and then select your meal. Once selected, the service was prompt with appetisers coming out quickly after the service of a little pre-appetiser to get the pallet going. I liked the addition of a little surprise before the meal, generous bowls of fresh bread with the meal and service that was efficient but not seen for the most part. This is a restaurant for special occasions and a great place to take special people. Serge Dansereau and his team are to be commended. Price: Set price for two courses – $78. 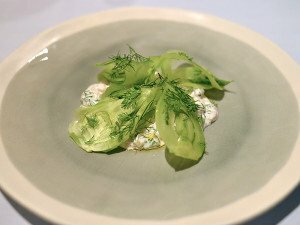 Three courses – $98.